- a d v e r t i s e m e n t - NoW IN PAPerbAcK! set in the colorful and exciting world of today's biotechnology, Forever and ever explores the unimaginable dilemmas posed by radical life extension. With carefully researched and detailed scientifi c scenarios, including the development of a stem cell generating artifi cial organ, the story follows the development of a highly plausible gene-based therapy that includes synthetic genes, nano-ball technology, organ printing, tissue engineering, and aspects of regenerative medicine that are in today's headlines. Compared to michael Crichton's best work, and in the Dan Brown genre of high stakes intrigue, Forever and ever takes the reader on a wild ride through the power dynamics that this revolutionary breakthrough would present. Caught up in this invisible vortex of brilliantly directed power, Jasmine metcalf struggles to save the life of a child dying of progeria, understand the unprecedented choices before her, and prevail against mysterious forces intent on controlling the age of biology. 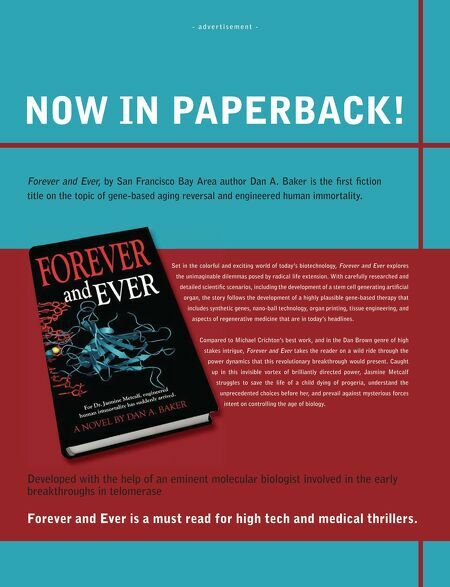 Forever and ever, by san Francisco Bay Area author Dan A. Baker is the fi rst fi ction title on the topic of gene-based aging reversal and engineered human immortality. set in the colorful and exciting world of today's biotechnology, the unimaginable dilemmas posed by radical life extension. With carefully researched and detailed scientifi c scenarios, including the development of a stem cell generating artifi cial organ, the story follows the development of a highly plausible gene-based therapy that includes synthetic genes, nano-ball technology, organ printing, tissue engineering, and aspects of regenerative medicine that are in today's headlines. Compared to michael Crichton's best work, and in the Dan Brown genre of high stakes intrigue, power dynamics that this revolutionary breakthrough would present. Caught up in this invisible vortex of brilliantly directed power, Jasmine metcalf struggles to save the life of a child dying of progeria, understand the unprecedented choices before her, and prevail against mysterious forces intent on controlling the age of biology. set in the colorful and exciting world of today's biotechnology, the unimaginable dilemmas posed by radical life extension. With carefully researched and detailed scientifi c scenarios, including the development of a stem cell generating artifi cial organ, the story follows the development of a highly plausible gene-based therapy that includes synthetic genes, nano-ball technology, organ printing, tissue engineering, and aspects of regenerative medicine that are in today's headlines. Compared to michael Crichton's best work, and in the Dan Brown genre of high stakes intrigue, power dynamics that this revolutionary breakthrough would present. Caught up in this invisible vortex of brilliantly directed power, Jasmine metcalf struggles to save the life of a child dying of progeria, understand the unprecedented choices before her, and prevail against mysterious forces Developed with the help of an eminent molecular biologist involved in the early breakthroughs in telomerase forever and ever is a must read for high tech and medical thrillers. Bio: Roger Pederson, Won't You Please Come Home? Unreal Tournament: Was That a Bot or a Human? What if Travis Bickle was "The Thing"?